A graveside service took place today at the Fern Prairie Cemetery for Charlotte E. Albert, who died Oct. 24, 1987, in Vancouver. She was 81. Mrs. Albert was born April 29, 1906, in Illinois and had lived in Camas 48 years. She was a homemaker, attended Harvest Community Church, and was a member of the ‘49ers Trailer Club and the Chubettes Club of Camas. 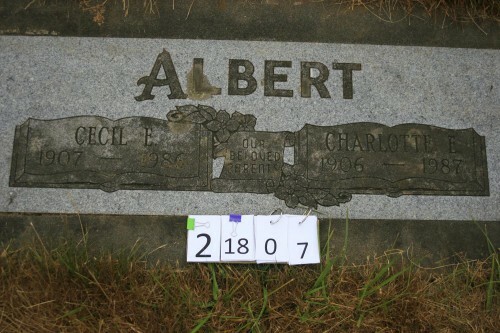 Mrs. Albert was survived by her son, Richard Albert of Camas; her daughter, Rebecca Huss of Camas; her sister, Elaine Nordstrom of Centralia, Ill.; and her grandchildren, Wade Huss and Guy Huss, and Andrea Albert and Katherine Albert; and numerous nieces and nephews. The Rev. John Reynolds officiated the service. Brown’s Funeral Home cared for arrangements.